Of the pioneers who ushered in the “Golden Age of Hip Hop” in the 1980s, only one of them can claim England as their birthplace. Alas, the linguistic master, Ricky Martin Lloyd Walters, known across the globe as Slick Rick, has British roots. With his signature eye patch and opulent, regal jewelry, Rick’s incomparable style and lyrical prowess are as respected as any other in the rap game. The most-sampled hip hop artist of all time (his words & beats appear in over 600 tracks by other artists), Rick the Ruler got his start in ’83 when he joined Doug E. Fresh in the Get Fresh Crew. 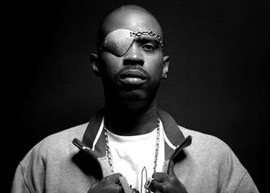 Within five years he would release The Great Adventures of Slick Rick, which launched his solo career and firmly established him as the lyricist of his generation. Add three other albums to his credit, as well as an outrageously extensive list of collaborations with the top names in rap (Jay-Z, Missy Elliot, Mos Def, to name a few), multiple TV and film appearances and honors, awards & inclusion on every esteemed list of superlative hip hop performers ever. But the magnanimous Rick hasn’t stopped there; he mentors kids on the dangers of violence, and his many philanthropic endeavors help to raise awareness and much needed funds for underserved communities. Needle drops, scratching, and whole bag of previously unheard of deejay tricks: all were developed and perfected by Theodore Livingston. This Bronx native is indeed the sole creator of the vinyl manipulation technique known as ‘scratching,’ the quintessential, original component of deejay expression. Since he debuted this ubiquitously imitated practice, GWT has been regarded as a premier innovator in the hip hop space. His first group, Grandwizard Theodore & the Fantastic Five, are one of the original old-school hip hop ensembles. They released the indomitably funky single “Can I Get a Soul Clap” in 1982, and were soon after featured in the first ever hip hop DJ film, Wild Style, and subsequently the doc Scratch, where Theodore elucidates the origins of his signature move. His track “Fantastic Freaks at the Dixie” contains the line ‘Say turn it up,’ which has become one of the most well-known and sampled phrases in hip hop culture. Playing at shows all over the world, GWT has deejayed for Kurtis Blow, Roxanne Shante, Mele Mel, KRS-One and many more. He now teaches classes on the history of hip hop, and is represented on the small screen in the current Netflix hit The Get Down. Labels: Of the pioneers who ushered in the “Golden Age of Hip Hop” in the 1980s, only one of them can claim England.